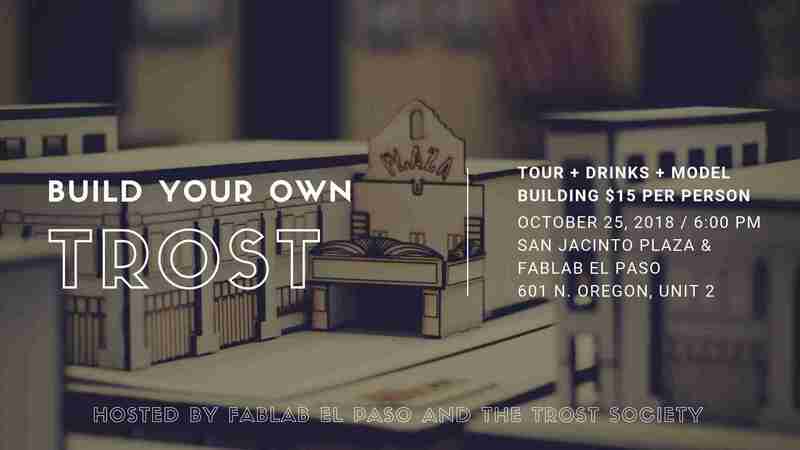 Join us for a beautiful evening of downtown historic tour ending at Fab Lab to build your very own Trost model. Choose from four designs: Mills, Plaza, Kress, or O.T. Join us for a beautiful evening of downtown historic tour ending at Fab Lab to build your very own Trost model. Choose from four designs: Mills, Plaza, Kress, or O.T. Bassett and team construct while you network with architecture enthusiasts. Enjoy a complimentary beverage of your choice from Brew Lab, including craft coffee, tea, beer, or wine. Tour, drinks, and models—all in support of two local non-profits. Don’t miss out on this architecture experience! The mission of the Trost Society is to promote the legacy of Trost & Trost, one of the most iconic architectural firms of the American Southwest, and educate the public about the architectural heritage of our region and the benefits of historic preservation. Fab Lab El Paso is a makerspace and STEM Lab that focuses on digital fabrication and advanced digital skills education. The Fab Lab Network is an open, creative community of fabricators, artists, scientists, engineers, educators, students, amateurs, professionals, of all ages located in more than 78 countries in approximately 1,000 Fab Labs.